Up and Running in AWS, Now What About Security? For many businesses, security, compliance and data protection in the cloud have been a major challenge due to the shared responsibility model and automation of public cloud infrastructure. Trying to force fit traditional security tools into an agile infrastructure like AWS can be time consuming and clumsy, and ensuring consistent security controls requires new practices for security and auditing teams. 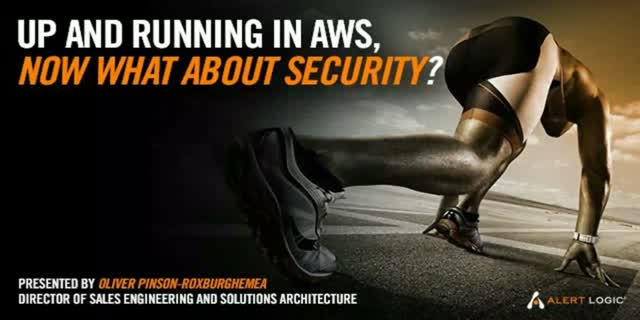 Register for this impactful webinar presented by Oliver Pinson-Roxburgh, EMEA Director of Solutions Architecture at Alert Logic, as he walks through the vital AWS security best practices you need to know about and how to design your application security strategy so that it integrates with AWS. Title: Up and Running in AWS, Now What About Security?